So, what is a Sabatier Knife? Way back at the beginning of the 19th Century, two separate French families named Sabatier were making kitchen knives in Thiers, France and started using their name as a marketing tool. With the concept of trademarks and copyright only barely in existence, the name Sabatier became a mark of high quality but was free to be used by anyone. The term ‘Sabatier’ usually means that the knives are fully forged from a single piece of steel with riveted handles and high quality sharpening. Each Sabatier brand now must contain a second word in order to distinguish it from others. Because the term Sabatier could be used by anyone, it is no longer a reliable mark of quality. There are plenty of mass-produced, poor quality knives out there bearing the Sabatier name and it can be difficult to work out which are worthwhile. In 1979, the branded Sabatier companies formed an association which is designed to protect the Sabatier name. Over the years the original Sabatier brands have been bought, sold, split and merged but, interestingly, they can be traced. For instance, one of the two original Sabatier brands, Moutier Sabatier was sold to Cuisinox which was owned by Couzon which was bought by Amefa which also bought Richardson Sheffield who own the two Sabatier ranges, V Sabatier and R Sabatier. Although Sabatiers differ in quality from one brand to the next and vastly when it comes to mass-produced poorer quality Sabatiers – when you actually look and feel them, you can clearly see high from low quality. Typically, Sabatier knives are fully forged – made from a single piece of steel with the separate handle cover riveted on. This full tang, riveted design is particularly strong and solid. Due to the expert sharpening process, Sabatiers are usually not only very, very sharp but their sharpness also lasts a long time before it needs sharpening again. They usually feature the slightly ergonomically shaped handle, have an iconic design and are very recognisable. The key feel to a high quality Sabatier is good weight and balance in the hand; lower quality knives are lighter and flimsier. As the term Sabatier becomes more and more of a household name, it’s increasingly common to see Sabatier knife sets on the market. 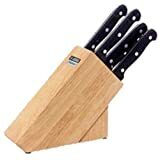 To get the Sabatier quality in a 5 or 9-piece sabatier knife set will make a huge difference to the way you cook and some brands, notably Richardson Sheffield, produce aesthetically brilliant Sabatier knife blocks as well. Although a true Sabatier could be said to have been only produced in Thiers, France, there are plenty of expert companies making supreme quality Sabatiers. And some make not so supreme Sabatiers. There are even some French companies making poor quality, mass-produced versions. Reading Sabatier knife reviews is pretty crucial to making a good decision, if you’re going to spend hard earned cash on a Sabatier knife block set, you want to know it’ll last for decades and be wonderful to use. Below is a summary of the Sabatier knives we’ve reviewed and you can go to their full reviews to check them out further. Richardson Sheffield has been producing knives for almost 200 years and was bought by the homewares giant, Amefa, in 2007. They produce the V Sabatier and Sabatier Trompette brands. The V Sabatier is made from Chrome Molybdenum Vanadium high carbon stainless steel and is incredibly strong. It has a really good weight and balance and cuts through foods with serious ease; not a range you want to get a finger caught under! With a 30 year guarantee, a Rockwell hardness rating of 55 and a finely tapered blade, these knives are some of the best out there. 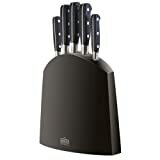 The only real knife difference between the modern black 5-piece and the wooden block 5-piece set is the cook’s knife. The black set has a 20cm cook’s knife while the wooden set has a 15cm knife. The difference probably isn’t enough to sway your decision much and it’s definitely more of an aesthetic choice – both as useful as each other. 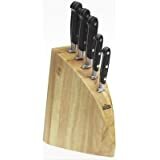 Whether you’re looking for an ultra-modern 5-piece Sabatier knife block or a classic wooden one then you’re fully catered for as well as having the option of a 9-piece V Sabatier knife set. Along with their V Sabatier sets, this accomplished company also have the Sabatier Trompette brand. The Sabatier Trompette range is made from Martensitic stainless steel and has a sleek, modern style to it. 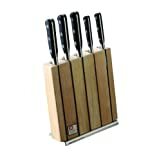 Very strong, very sharp, the 5-piece Sabatier Trompette set comes in probably the most attractive wooden block you’ll find. 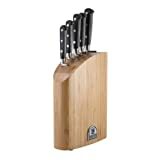 This set contains the five fundamental kitchen knives any cook will need regularly, but if you’re more of a specialist, it’s worth considering the V Sabatier 9-piece set with its additional carving fork, vegetable knife, boning knife and sharpening steel. The Judge 5-piece set has Sabatier engraved onto each handle but compared to some other brands, it doesn’t quite have that stand-out high quality look and feel. It comes at a good price and is certainly suitable for the occasional and every day domestic chef but for those who really want to get the most out of the Sabatier name, this isn’t it. 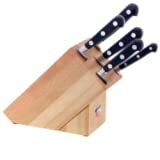 The wooden block does its job but isn’t brilliantly constructed or designed and the set contains a boning knife where others would have a utility or all-purpose knife. Read our Judge Sabatier Knives review. For the money, it’s not bad at all – for the Sabatier name, it’s not the greatest. If you want that weighty, impressive feel then look elsewhere. If you want a decent set of sharp knives then you could do worse. As with most things, you pay for what you get. Richardson Sheffield can seem expensive compared to other brands but you’re talking about a knife set that should last you thirty years at least – much longer than the car you’re driving around. When you invest in a Sabatier knife set, you should be able to feel the high quality each time you pick up one of the knives and relish in the ease of the knife block itself. The Sabatier name can up the price tag so if you want Sabatier, it really is worth going to the best. Otherwise, there are plenty of different knife brands out there that are better than a poor quality Sabatier set.